Which liquid cooling solution is right for me? In the previous article we compared air cooling and liquid cooling. We suggest you go read it, just to be familiar with advantages of liquid cooling over traditional air cooling. 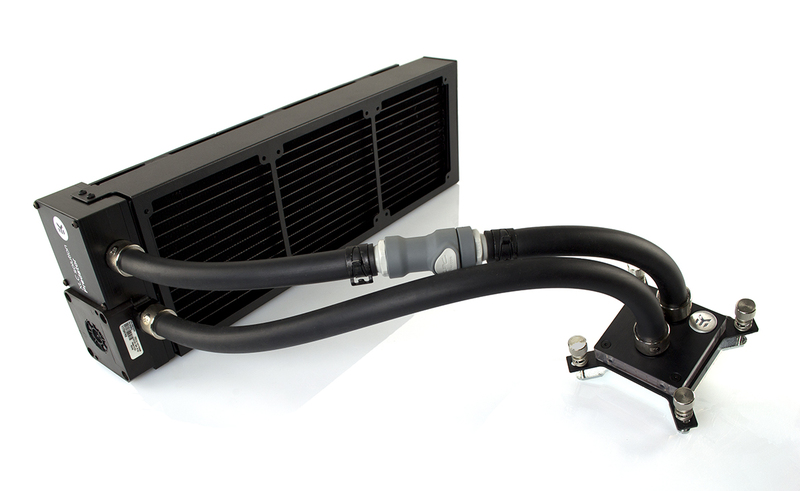 In this article we are going to explore what types of liquid cooling options are available. We’re going to cover the key differences between what’s out there and help you decide which product is right for you. Technically, any heatsink with liquid coolant flowing through it can be called “liquid cooling”. Because of that, there are multiple types of liquid cooling solutions available on the market, which sometimes causes confusion as to which one is best for your scenario. 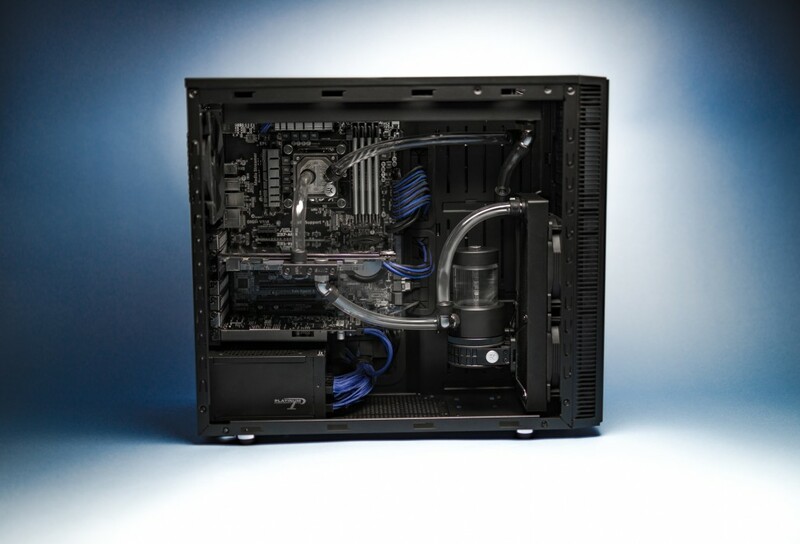 There are 3 ways to liquid ­cool your components: an “all-­in-­one” system, such as EK-XLC Predator series; then there are pre­packaged kits such as KIT series , and, finally, there is the “full custom loop” approach. Let us start with ​AIO “all-­in-­one” solutions​. 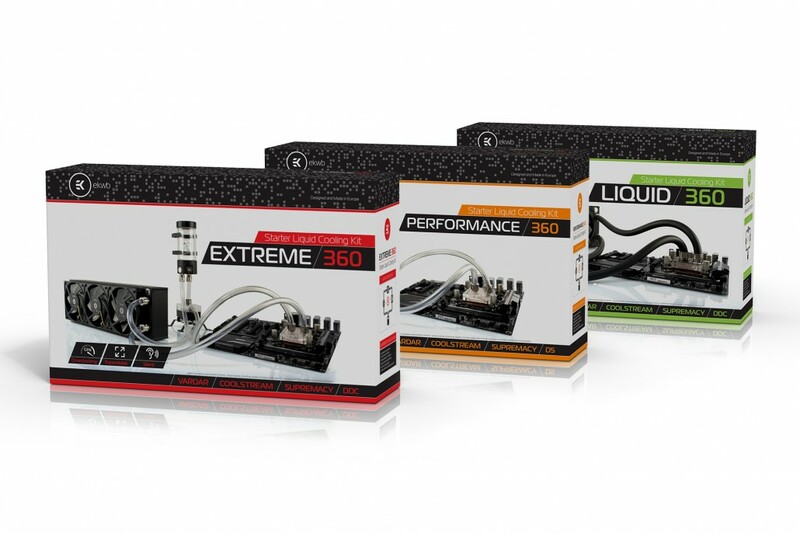 These combine the core components of any liquid cooling system (waterblock, pump, reservoir, tubing, radiator & fans) into a single pre-­assembled and pre-­filled unit. 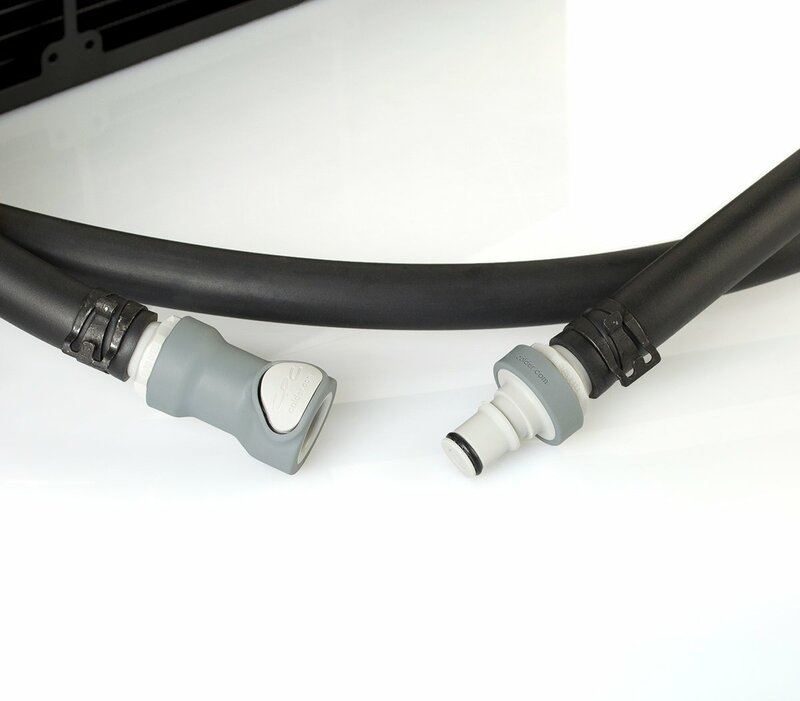 These are relatively inexpensive and are the easiest to install and maintain. EK-XLC Predator 360 – the most powerful all-in-one on the market. Available with a variety of sizes, these units are about as easy to install as a regular heatsink, just need to ensure your case has the mounting space for the radiator and that the tubing is long enough. AIO’s do not require refilling, and need about as much maintenance as a regular heatsink, e.g. dusting it once in a while. The downsides to running a typical AIO are lower performance (when compared to a kit or a full custom setup) as well as not being expandable to cool anything but the central processor. Reason for relatively inferior performance is usage of cost­-effective and compact components to reduce both size and price of the unit. While some AIO manufacturers do make relatively cheap adapter brackets enabling usage of an AIO unit designed for a processor on a graphics card, it is less than elegant solution, despite the low cost and ease of install may make it appealing. EK-XLC Predator series of AIO’s was released specifically to address these two issues of sub-par performance and lack of expandability. Ready to be “plugged ­and­ played” out of the box, these units use enthusiast-­grade core parts in order to increase performance and longevity, and most versions are in fact expandable to easily include a graphics card into the loop. While occupying the price bracket above an AIO, these have been referred to as “one AIO to rule them all” for a reason. Quick Disconnect for simple expansion with additional water block. Next up, we have ​the kits​. Kits do require an assembly and filling with coolant but come with pre-­selected parts in order to take the guesswork out of “what parts do I need for my first loop exactly?” Make no mistake, a KIT solution is already a full custom loop solution for liquid cooling your CPU. Not only do kits have all the core parts, but are usually less expensive than getting the exact same parts stand­alone due to combined packaging and unified documentation. EK kits even come with a manual outlining the entire loop construction process while individual parts only cover themselves. 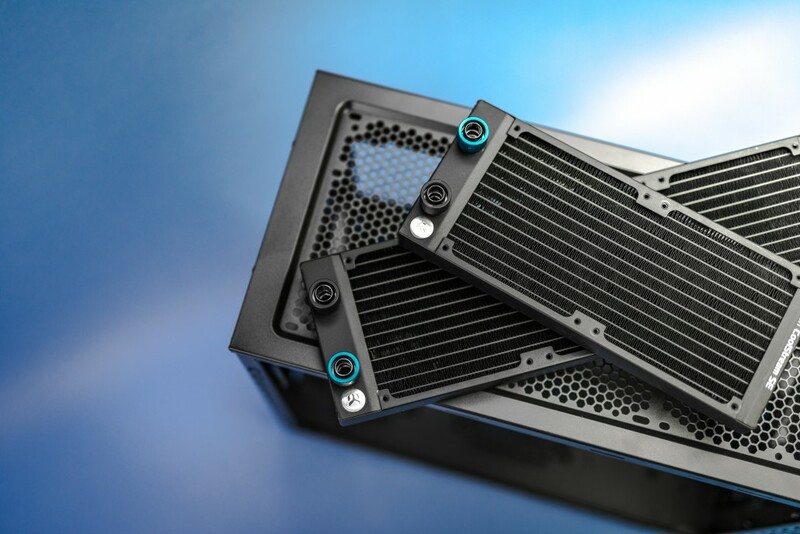 Lastly, these can be expanded to include extra cooled components such as graphics cards, but keep in mind that you may need an additional radiator. Downsides to getting a kit, especially for a first loop, are few: if you prefer coolant and/or tubing to be of a different color than what comes with a kit, that would need to be purchased separately. These kits, just like a custom loop would also require flushing and re­filling sometime down the road, but a properly constructed kit usually lasts for about 2 years before a flush is recommended. We have 3 versions of kit setups: ​L­​, X and the new P series. ​L series kits are our entry-level model kits, covering the essentials of a solid loop and represent a great basis for future upgrades. X series kits are designed for extreme performance and overclocking, while P series kits are meant for people who want something in between. Convenient specs comparison table is at the bottom of ​this page. Lastly, we have a ​full custom solution​. This is the pinnacle of liquid cooling, and is the approach of picking out the entire loop piece by piece, everything from main parts to the tiniest cable and adapter. While such an approach requires thorough research, careful planning and is more expensive than the other two, the benefits are both performance level attainable only by going “full custom” as well as an immense pride of ownership. You see, we at EK believe that a custom loop is a fusion of technology and art, akin to a custom automobile, as can be evidenced from our gallery. Aside from having your loop use ​precisely ​the components of your choice, from pump to coolant, one can truly create a reflection of himself as a gamer or enthusiast by doing his loop the hard way. Multiple customization and performance options such as drain valves, multiple colors for the fittings and even hard tubing are available for a custom loop, which can be leveraged to attain that head-­turning look. How to start with a custom loop? It is always a good idea to post a loop plan up on our forums to have it reviewed by the community before hitting the check­out button. We pride ourselves on both providing useful guides on our site as well as being deeply involved with the community through ​our social media and official representation on partner forums (such as on ​overclock.net​ and ​ASUS ROG​) in order to help a budding enthusiast have his loop come out as close to his vision as possible. While a list of parts available from our web shop and/or authorized resellers is in the hundreds of items and can feel overwhelming, we hope that the resources we offer can help you channel your inner geek and perhaps even have the end result featured on our social media/Mod of the Month! You can see up to date pricing of the solutions covered above here.